While watching Dr. Rankin on PBS I was reminded that people often live way too much of their lives in a "stress response" mindset rather than thinking in a positive "relaxation response" manor. This made me immediately think of the expression "don't sweat the small stuff! ", because most of the time a majority of your daily stressors can be avoided. By finding ways to eliminate unnecessary stress throughout your day you will be able to spend more time in a positive state of mind, enjoying life, which will help you live longer and heal many ailments. Practicing meditation and thinking positively will help change and shape the way you think, which is equally as important for your health as going for an annual check-up and testing. "YOUR health is YOUR business", says Dr. Rankin. It is YOUR responsibility, not just your physicians, to care for our body and MIND. Dr. Rankin recommends focusing your mind on these tips will "utilize your bodies self-repair systems, optimize your energy, health and longevity". I believe that how you manage your life, mind and body plays an important factor in living a healthy, disease-free, happy life. 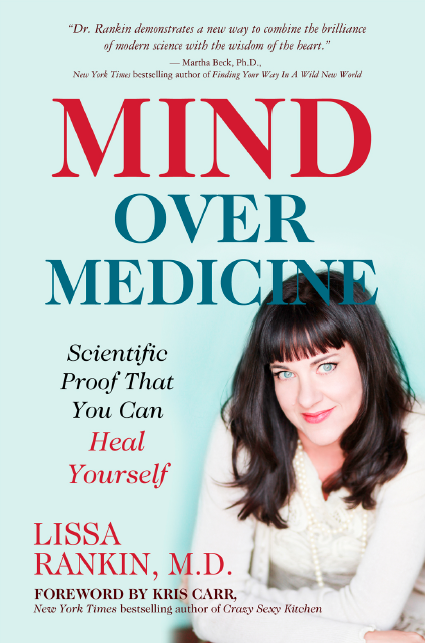 I can't wait to receive my copy of “Mind Over Medicine”, by Dr. Lissa Rankin! Beth Bielat has spent 35 years as a fitness professional. She is the fitness director for Joan Lunden’s Camp Reveille as well as the fitness professional and manager at the Ocean reef Club in Key Largo, FL. Beth specializes in life coaching, martial arts, self-defense, yoga, tai chi, and she is a certified nutritional councilor. Beth founded the LifeBreath Institute and she is an author and speaker on health, nutrition, and fitness. Beth is also a mom, grandmother, devoted wife, outdoor enthusiast including cycling, hiking, canoeing, backpacking and swimming, healthy cooking devotee and a strong believer in spirituality and faith.